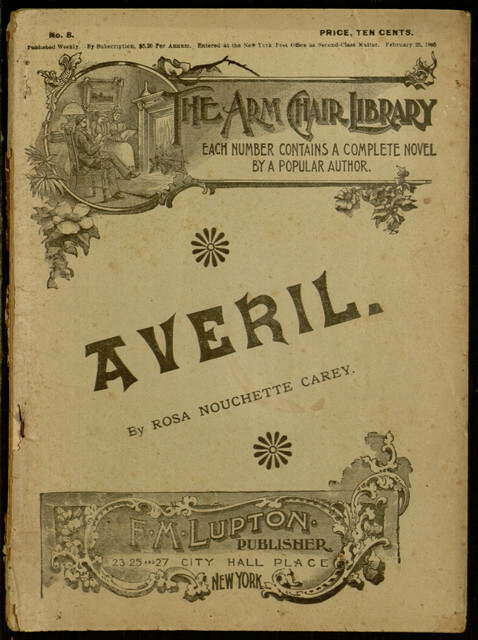 Today’s eBook release, Averil by Rosa Nouchette Carey, is one of countless British novels that reached American audiences through inexpensive (and frequently unauthorized) paper-covered editions. The text of the new electronic edition comes from one such series of reprints, F. M. Lupton’s Arm Chair Library. While these cheap editions often resemble their contemporaries, the dime novels, their content is often less sensational. 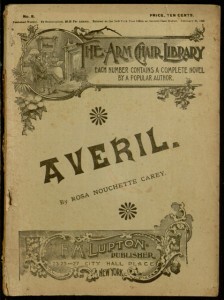 That is certainly the case for Averil, which, despite a few dramatic incidents, is primarily a quiet tale about a sickly, spiritual woman who tries to befriend an orphaned cousin and aid the poor while being taken advantage of by selfish relatives. The entire text of the book may now be read online (or downloaded in common electronic formats) through Project Gutenberg.